MANILA, Philippines - Ride hailing service UBER System Inc. (Uber) has resumed operations on Tuesday, August 15, after filing a motion for reconsideration against its one-month suspension imposed by the Land Transportation and Franchise Regulatory Board (LTFRB) on Monday. Because of its failure to follow the LTFRB’s order issued on July 26 to stop accepting and activating additional Transport Network Vehicle Service (TNVS), the agency earlier ordered the suspension of the transport network company’s accreditation and online booking application for a whole month. The LTFRB ordered Uber to extend financial assistance to its operators, who will be directly affected by the suspension. On Monday evening, Uber complied with the LTFRB’s order and announced that it is temporarily suspending its operations. However, the company decided to resume its operations until the motion is resolved. 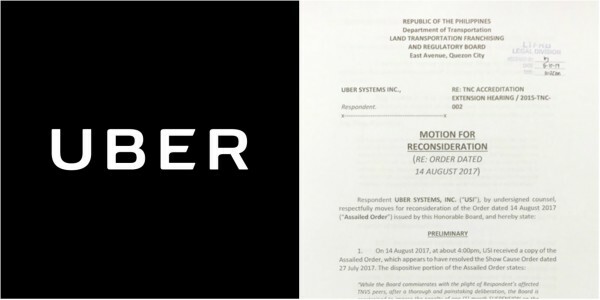 According to LTFRB board member Aileen Lizada, the board is yet to make a decision whether Uber’s motion for reconsideration is denied or approved. She warned that if Uber remains to be online, members of the Metro Manila Development Authority and the Highway Patrol Group of the Philippine National Police will apprehend them. While many Uber passengers expressed their disappointment over LTFRB’s controversial decision, Malacañang maintained its support to the agency.